Guido (Homepage) wrote: Condivido pienamente l'entusiasmo di tutti i commenti precedenti. Una foto strepitosa! wids (Homepage) wrote: wow... an amazing detail. great shoot! Simone (Homepage) wrote: Simpaticissima! Hai colto proprio un gran bello scatto! photo retouching (Homepage) wrote: Great shot, great colour. I just hope he/she wasn`t pushed! Ian (Homepage) wrote: Gorgeous colours, absolutely eatable! Looks even better with the black silhouette. tom (Homepage) wrote: Hope, it is not falling too deep. Riri (Homepage) wrote: wow ! What a catch! Cristian (Homepage) wrote: Lovely shot! LightningPaul (Homepage) wrote: Looks like the ant is flying somehow. That looks weird. DOF and back lighting are super. Goncalo Figueiredo (Homepage) wrote: Great capture and excellent domain of DOF. 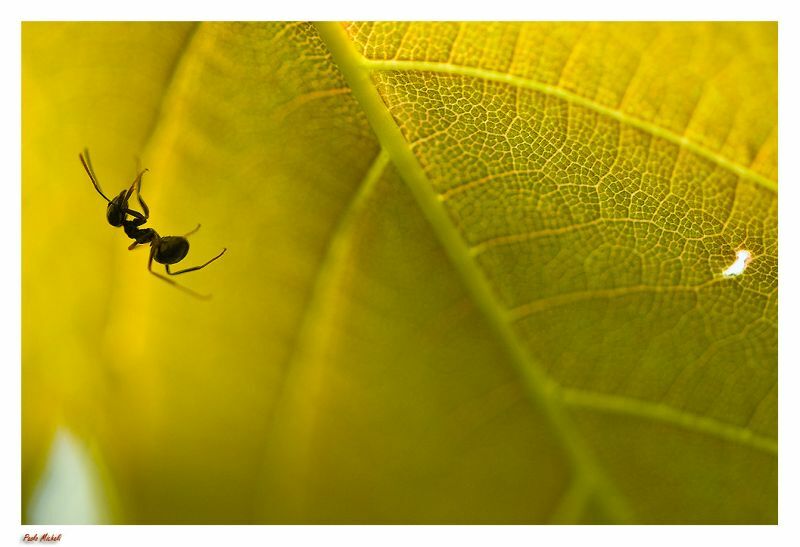 Arnd (Homepage) wrote: I love the image detail, the silhouette of the ant and the fitting title! Colors Inc (Homepage) wrote: great title, and especially the leaf structures and colors on the right are really beautiful! great photography! Melinda (Homepage) wrote: Poor little guy... gorgeous shot though. Aaron (Homepage) wrote: Wonderful shot. I love the tone and movement of this one. beanow (Homepage) wrote: Paolo, masterly shot!!! Tero (Homepage) wrote: Refreshing, strong composition. I like it. It not so ordinary. Tom (Homepage) wrote: Great capture, great colors. I love the texture on the leaf. Mike (Homepage) wrote: Excellent. I wish I could do this. Great color and detail on the leaf. Really nice sharpness on the ant. Andrés (Homepage) wrote: An amazing close-up. Very cool. Nacho Carreras (Homepage) wrote: Fantástica imagen. Saludos. Susan (Homepage) wrote: Incredible macro with amazing detail! Love the contrast of the black ant and the golden leaf. grant (Homepage) wrote: amazing macro! Sophie Asselin (Homepage) wrote: Wow ! What a nice shot ! Great colors ! Congrats !